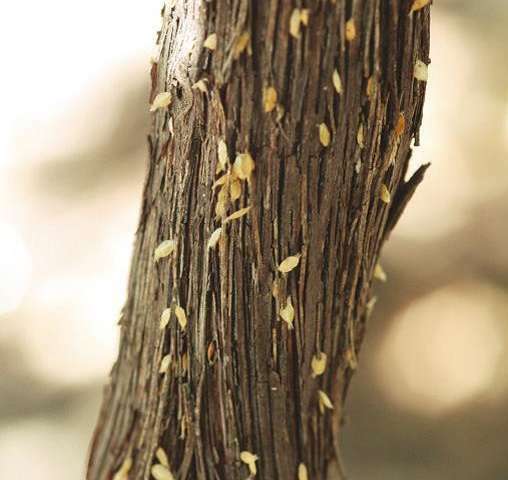 Since 2011 an unknown leafmining moth was observed in table grape orchards and often in large numbers in the Paarl region of the Western Cape (South Africa). Although the effect of the leafmines on the grape vine itself appears to be limited, collateral damage may be more serious, especially when larvae descend from the vine canopy to form a dense curtain of suspended larvae. A new study published in ZooKeys looks into the morphology and biology of the potential pest. Although the leafminer had been seen before in South Africa, it proved impossible to find its name. Entomologist Henk Geertsema, professor at Stellenbosch University turned for help to Erik van Nieukerken, researcher at Naturalis Biodiversity Center (Leiden, the Netherlands), who had just described a similar invading leafmining moth from Italian vineyards. Both the new mysterious species and the one recently described from Italy belong to the family of the shield bearing leafminers (Heliozelidae), a moth family that has been poorly studied globally. After some consultations the two scientists concluded that the South African moth appeared to be an unknown species of this family, closely related to the European Holocacista rivillei. 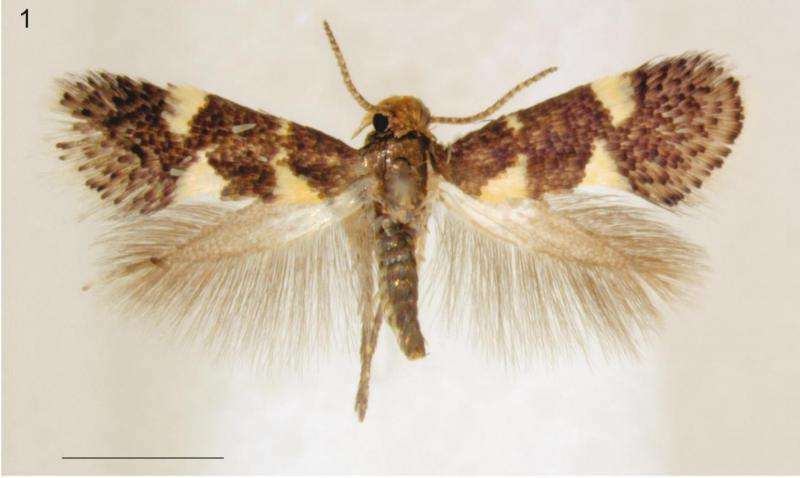 Study of the collections of leafminers, assembled by the late Lajos Vári of the Ditsong Natural History Museum (formerly the Transvaal Museum) in Pretoria showed that South Africa in fact has a rich, but unknown fauna of this moth family, of which several species feed on wild grapes or bush grapes (Rhoicissus species) throughout southern Africa. By detailed taxonomic study it was shown that the grape feeding species had previously been collected on wild grape near Wilderness, Western Cape. It is believed that it shifted from this original host to cultivated grapes in the wine and tablegrape producing areas of the Western Cape. The unknown insect is now described as Holocacista capensis. It is a tiny moth with a wingspan of ca. 4 mm, with some silvery white spots on its wings. The eggs are inserted in the leaf, and the larva eats a tunnel inside the leaf, creating the so-called leafmine. The full-grown larva subsequently cuts out a shield from the leaf, leaving behind characteristic holes. The larva is able to move around in this shield and usually descends by a silken thread to attach it to a trunk, trellis, leaf or even on grapes. The larva pupates inside the shield, and moths emerge a few weeks later. In winter the larva it hibernates in the shield and the first moths appear in September. Moths are seen from September until early May. There are several generations annually, with peak numbers in February and March. In fact the first records of this moth from grapevines in Pretoria date back to 1950. At present, the moth is widespread in the grape vine regions of the Western Cape, but mainly restricted to the region south of the Cape Fold Mountain range. In the northern part of South Africa, it occurs in high population numbers in the table grape region at Brits, East of Pretoria. 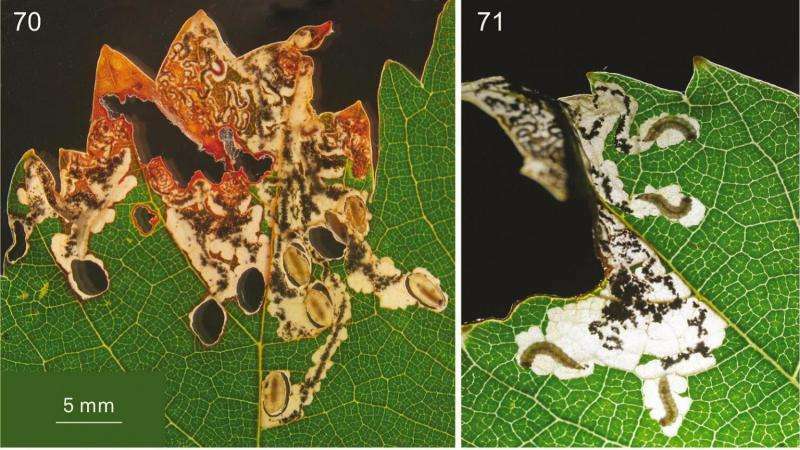 The effect of the leafmines on the grape vine itself appears to be limited, but collateral damage may be more serious, especially when larvae descend from the vine canopy to form a dense curtain of suspended larvae. Taxonomic knowledge of these insects in South Africa is often insufficient, and the discovery of a pest often leads to extensive taxonomic research.